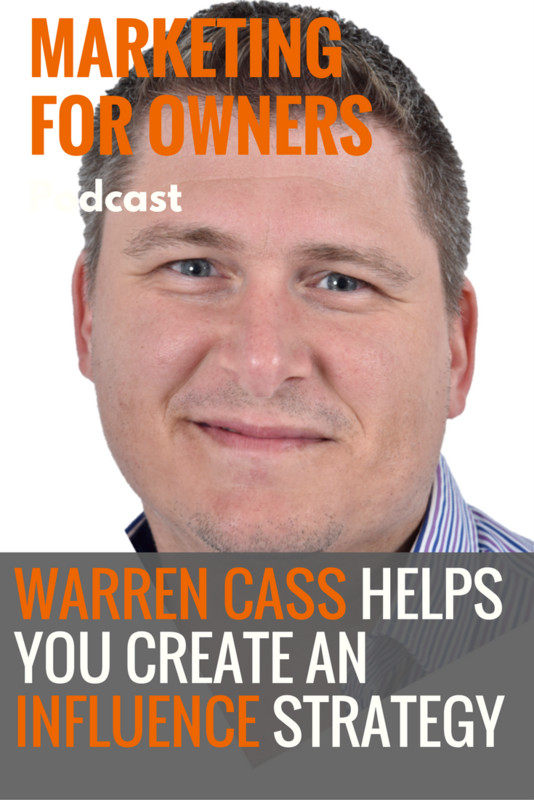 Warren Cass is a speaker, author, and expert when it comes to disruptive marketing, connecting with people, and managing your influence. In fact, he has come a long way from running raves as a teenager. However, that is what led to him becoming the manager of the biggest nightclub in South West England, with 120 staff, at the age of just 17. It was his over-confidence and lack of experience at the time that then lost him the job at 18 years old. In the 90s he then built an IT business during the contract market boom, which he later left in 2003. That’s when he decided he wanted to go back to doing what made him happiest, which was bringing people together. A part of the face-to-face networking boom, Warren has spent the past 15 years helping business men and women to achieve better results. Helping people gives him a great deal of satisfaction, and just one solid introduction can result in a business partnership which can improve lives and businesses. And he’s now going to help us to ensure we stand out in an increasingly noisy world to make relationships and build your influence. As a business owner himself, Warren knows how easy it is to make a tonne of mistakes, and some of them have been very painful. So for what he does now, it is about stopping other people from making those same mistakes. There is an astonishing number of businesses which fail in the UK within three years of starting. And they’re often failing in the same ways as the businesses which came and went before them. This points to a lack of knowledge being passed on, and this is one way in which Warren aims to help. One of the common problems is the pressure which people feel. They go on social media and only see the successes which their idol had. But that’s only because we only share the good news stories about ourselves. As a result, people don’t see that successful people actually fail. Another issue is the way in which we define ourselves. Are you self-employed, an entrepreneur, or a business owner? The role we give ourselves affects the way we operate, and what we feel we should and should not do. But one thing is certain, that as the operator of a business, you are a salesman at some level. Don’t let that put you off because 21st century selling the slimy, foot-in-the-door approach which we think it is. Selling is consultative, building relationships and rapport, and solving people’s problems. The softer approach is beyond doubt the preferred method, and that will come as a relief to people who are put off from defining themselves as a salesman. We live in a world where we are bombarded every single day with countless marketing messages. So how do you stand out in all of that noise? With disruptive marketing, you interrupt those patterns which we creatures of habit live by. It could be as simple as changing the language, or not doing the thing which would be expected of you. It might be the way you dress, speak, or just by simply being in the ‘wrong’ place. From a small business perspective, it can involve studying your marketplace and thinking about the technologies used today, the future trends, and then be in front of all that. Even giving a service which is above and beyond is disruptive, just by simply giving someone more than they had expected. But disruptive marketing isn’t a strategy, but rather a mindset. It’s something to think about as you carry out your normal marketing activities but is what makes the difference to actually stand out and be seen. You need to give things a try and then look at the numbers. Knowing what works and what doesn’t means you can do more of the stuff which works and less of what doesn’t. Split test, monitor where your traffic comes from, and using follow-up campaigns are all ways of achieving it. Never has the pace of change been as accelerated for the human race as it has been for the past 20 years. As a result, we have different generations who have vastly different experiences. Millennials who grew up with technologies are the digital natives, and all of us who are older are the digital migrants. The digital natives have been conditioned by their environment, and that has given them different attitudes to lots of things. There is a cultural change, more diversity, a different economic situation, and a growing world population. These all influence our consuming and buying habits. Those millennials typically have more debt and get married, have kids and buy a house much later than the generation before them. We are, generally, no longer as brand loyal as we used to be, and from a marketers’ point of view, the world has changed a lot. If you are using one tone of voice for your marketing, and have a multi-demographic audience, then the chances are, you’re not talking to everyone. You need to find a way of personalising and adapting your message. Uber was disruptive and it has resulted in a multi-million dollar business. Yet, they are using old technology. All they have done is reimagined how it is used and made it available for consumers via their mobile phones. So become a student of change within your niche or marketplace. You can start by simply typing ‘What does the future hold for [insert your profession here]?’ You’ll likely then find plenty of content on the topic. It is also a good idea to stay constantly aware of the technology your audience is using to communicate and to then make sure you’re always there. Influence is also changing. We once looked up to politicians, those who achieved incredible things, and then celebrities. Yet the younger generations have a different idea of what a celebrity is. They look up to the YouTubers and other internet stars, and not just the prolific people who appear on TV and in film. When it comes to the best books on the topic of influence, How to Win Friend and Influence People by Dale Carnegie and The Psychology of Persuasion by Robert Cialdini lead the way, and Warren recommends reading them. But they were both written before the digital age, and whilst they still impart important skills and teach us how to communicate with each other face-to-face, there are many opportunities beyond that. Now, when the tactics they teach are used obviously, someone can easily tell what you’re attempting to do, and it actually has the opposite effect. Once you suspect you’re being manipulated, you no longer trust what is being said to you. With modern influencing, the key thing is to be authentic, natural and flowing, utilising all the different methods of communicating. In doing this, Warren recommends the PICKY method. People – This is made up of the networks you’re a part of, taking into consideration the psychology of how people communicate and making the most of the credibility by association to people and brands. Become self-aware to know what to recognise in others. Image – The way you dress, the colours you use, and the way your website and social media platforms all look like are key. What is the image you’re projecting, and what are the words you’re using in your marketing helping to create that image? Communication – It’s important to remember that is isn’t just about what you say, but how you say it and the actions you take. Knowledge – Demonstrate your expertise to show that you really can do what you say you can do and to manage expectation, which you can do by writing blog posts which share what you know. You – Through all of this, be honest with yourself and how you score on the important attributes. These are the qualities of you and your influence. To find out more information about him and what he does, then make sure to visit Warren’s website. He also has a wealth of free resources available to you at Champions of Small Business to support small businesses in the UK. His new book Influence is now available online and in store, and will help you to raise your profile, manage your reputation, and to get noticed. Helping you to devise your own influence strategy, each chapter finishes with a chance to reflect as you begin to build it up.